The Bourne Valley Inn is a traditional country pub and bed and breakfast which is tucked away in the small village of St Mary Bourne in the beautiful Hampshire countryside. Being a family friendly and dog friendly pub, we believe that food tastes even better when enjoyed in the company of loved ones. 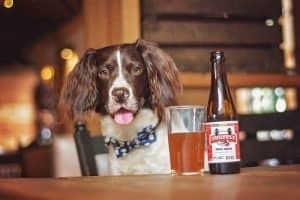 Dogs are welcome in our pub and bed and breakfast accommodation, and we always have a biscuit or a doggy beer behind the bar for your furry friend. In an area blessed with lakes and rivers rich in trout and other freshwater catches, fresh fish is a specialty here at the Bourne Valley Inn. We have an array of creative fish dishes for you to choose from, alongside traditional British pub favourites. All of our ingredients are sourced from local farms and estates, ensuring we provide our customers with the freshest and best ingredients possible. Enjoy our cottage-style rooms, where you can relax and unwind in your own private corner of the countryside at our Hampshire bed and breakfast. All room have recently been refurbished, with a fresh like of paint and even a new bathroom in some. Each room has its own quirky charm, from built in rustic wooden beds, to incredible rainfall showers. Each of our nine elegant rooms exudes a rustic charm, with quirky details that make your stay with us a memorable, relaxing experience. Every last detail has been carefully thought out, with natural Bramley products in the bathroom and sumptuous Feather & Black pillows and bedding. You’ll even find a complimentary tea tray, complete with coffee machine and a tea cake or two, so that you can enjoy your morning brew in the peace and tranquility of your own room. We have three ground floor rooms that are dog-friendly with beds and water bowls provided. Please note there is a small charge of £15 per dog.